Wood County’s Tree and Shrub sale has been offering landowners the opportunity to purchase trees at minimal cost for over 25 years! We offer a variety of conifers, hardwoods, shrubs. Wildflower and grass seeds are also available to purchase. “The best time to plant a tree is 20 years ago. The order form becomes available in November and is posted below. Trees can be ordered through mid-January. 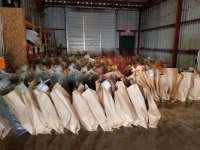 Tree pick up is located at the Wood County forestry garage at 650 17th Avenue North, Wisconsin Rapids, and typically occurs in late April depending on the weather conditions. All people ordering will receive a notice that will provide exact pickup details for their order prior to the scheduled distribution. If you are interested in participating in the tree sale, would like your name added to our email or mail lists, or have any questions, please contact the Wood County Land and Water Conservation Department at 715-421-8475 or email lruess@co.wood.wi.us. The 2019 wildflower and grass seed sale continues, see order form below. 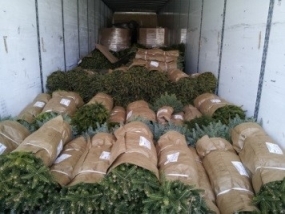 The 2019 tree sale ordering period has ended. Please check back again in the fall for our new order forms. Order early; popular trees sell fast! Payment, in the form of cash or check, is due at time of order. We cannot accept credit cards for payment – only checks or cash. Items not picked up on designated date/time will not be available for pickup or refund unless arrangements are made with our office prior to the distribution date. For additional details on the items below including up-to-date purchase and pricing information, please refer to the Tree Shelter and Generic Gel Information document. These products are available year round; please call ahead. Four-foot Plantra tree shelters protect seedlings from wildlife and ensure a warm environment for faster growth. Generic Gel is a starch absorbent that increases plant survivability by retaining water and giving it back to the plant during dry periods. 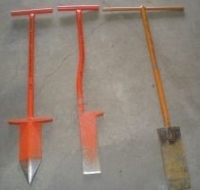 Tree spades are available after signing agreement.